Turns out I've seen 2 dramas by JTBC without knowing (Maids and Falling for Innocence) and i LOVED them, so i kinda had high hopes for this one! Especially as it was a medical romance drama with Distaster based theme! The special effects were done very well, I was a bit worried at first that the special effects would be awful and it would ruin the drama entirely but thank goodness they were good and made the scenes very realistic! It had been a long while since a drama had made me sit on the edge of my seat in suspense and left me watching the next episode straight after until 6am ;'D Yes there were unrealistic elements and plot holes in the story, some story parts felt a bit unnecessary and rushed, I wanted them to focus on the other minor character's growths, but we only touched on them, the main focus was put on the hospital which I think fair enough, it works but i think it would have worked even better if they had shifted their focus on other characters and their stories! 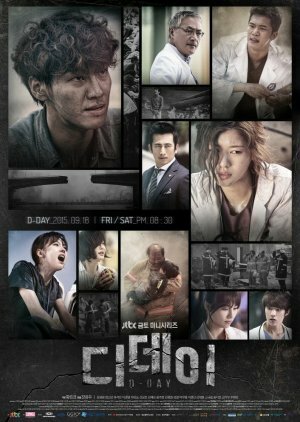 I hadnt seen Jung So Min in anything since Playful Kiss but she played her role exceptionally well and nailed the Busan accent! The chemistry between her and Kim Young Kwang was adorable, and the romance that we got was cute, I just wanted more! I know I know, its a disaster drama, obviously the medical side of things and saving lives is probably more important to focus on but ahhh they are both so cute! if we had that litttttlleee more i would have been satisfied! The other actors did really well! They were actors that I hadnt really seen in anything else before and I'm reeled in and want to watch them in their dramas too! The music was OK, it suited scenes and were soothing to listen to but they werent very memorable, I think i was too invested in watching the actual scenes to pay enough attention to the music! I'm not sure if i would rewatch this again, it made me think alot about earthquakes and kept me up at night or entered my dreams about if it happened to me so i was a bit unsettled in that sense, maybe, maybe one day i would rewatch it but skip through it for the really good parts, im not sure if i can sit through it all again. The antagonists in this were characters I hated watching! so i wouldnt want to rewatch their scenes! I also wished that they had shifted the story so that Jung so min's character was the main focus rather than just Kim Young Kwang's character i think it could have been a much more powerful drama. brb, whilst i go fangirl and watch all Kim Young Kwang's dramas!